Keep your skateboardcollection neat and organized with the 27" Del SolSkateboard Storage Rack. This wall mounted skateboard rackcan store up to eight skateboards and two helmets on a 30 degree angle. This rack is a great way to save space and keep your boards organized, but also works great as a skateboard display rack for those who like to show off their boards! 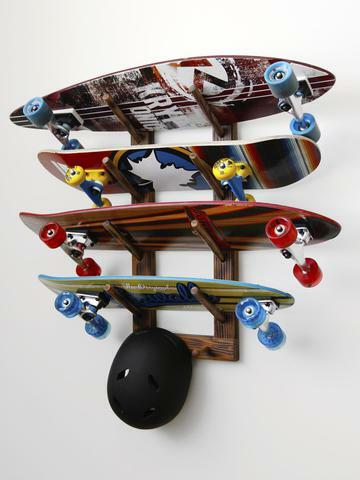 Racks that hold up to two and four skateboards are also available. Skateboards and helmets not included. Solid frame construction, built to last. Use in any room, easily mounts on any wall. Hardwood Birch dowels (pegs). All mounting hardware and screw hole plugs provided. Arms extend 8" perfect for long boards and skateboards Assembly level/degree of difficulty: No Assembly Required.